International coverage entirely ignores the July 19 demonstration of support for a Constituent Assembly, writes Iain Bruce. 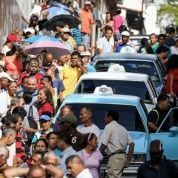 Did you hear the one about a practice election in Venezuela, where millions of people lined up from early morning until late at night, just to cast their vote in a dry run poll that meant absolutely nothing at all? Except to express support for another election in two weeks time? Actually, it’s not a joke. It did happen. On Sunday. Video shows them singing and dancing as they waited to test voting machines and see how the election of a new Constituent Assembly on July 30 will work. But you probably never heard about it. Because the world’s media, pretty much without exception, concentrated almost exclusively on the other vote happening in Venezuela on Sunday, an informal plebiscite held by the opposition, with no constitutional status, to oppose that Constituent Assembly. 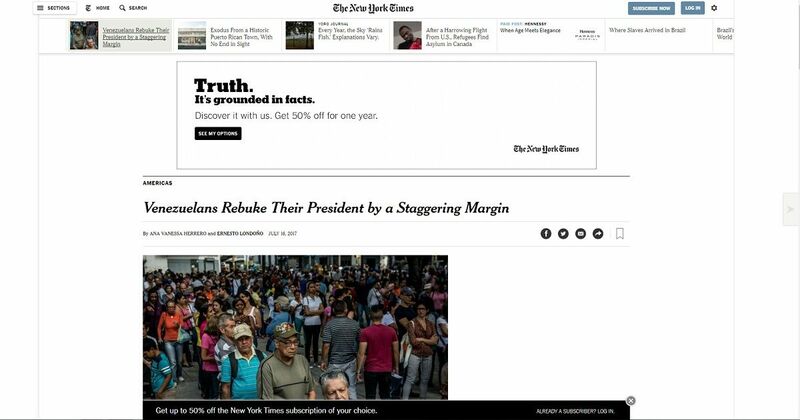 “Venezuelans Rebuke Their President by a Staggering Margin” states the headline. “More than 98 percent of voters sided with the opposition,” continues the paper that certainly would have sneered at results like this when the beneficiary was Saddam Hussain or Mobuto Sese Seko. Mind you, since only opposition supporters voted in this plebiscite, 98 percent is probably fairly accurate. The Times goes on to say this vote undermines “Mr. Maduro’s plan to appoint an assembly of handpicked supporters to draft a new Constitution”. Sorry, “Appoint,” “handpicked”? Was that what all those millions of mainly poor Venezuelans thought they were doing when they waited in line all day in favor of the right to vote for the Constituent Assembly? 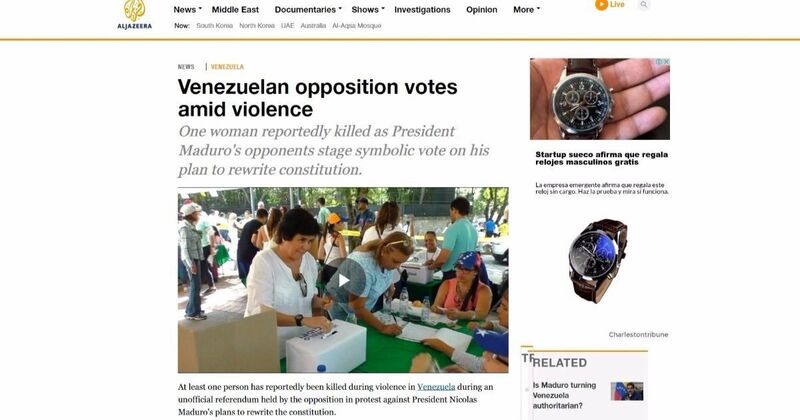 That must explain why some of them were still lining up at 10 p.m. after the exercise had been planned to finish at 4 p.m.
Really, was that the story in Venezuela on Sunday, as millions, voted peacefully on both sides of the political divide? Now a woman, a nurse, was indeed shot dead, in the working-class Caracas neighborhood of Catia, where there had been a confrontation between government and opposition supporters. But the circumstances are unclear and an investigation is underway. It’s certainly not clear who did the shooting, much less that they were men on motorbikes firing at a line of voters. But never mind, that story at least fits the assumed narrative of Chavista thugs terrorizing peaceful opponents that has shaped so much coverage of Venezuela in the last three months. So probably somebody thought it must be true. To give them their due, it seems the BBC did do some checking. By morning they had wiped that story and replaced it with a more sober headline. Sadly, Al Jazeera, The Guardian, and so on, didn’t fare a lot better. Now the opposition plebiscite certainly did get a decent turnout. They say almost 7.2 million took part. But none of those serious, fact-checking media saw any need to question that number, even though it is impossible to verify, and likely to be at least a little exaggerated. That’s because it was, of course, an informal ballot, with no roll of electors or way of telling whether people had voted twice, or even 17 times as one person was accused of. But let’s not be grudging. Let’s assume it was indeed 7.2 million. And let’s assume they all voted against the Constituent Assembly. None of these media told you that there are almost 20 million registered voters in Venezuela. So that would mean 37 percent had supported the opposition. That’s a little bit less than the percentage that Venezuela’s opposition have got in most of the more than 20 elections held in this well-known dictatorship in the last 18 years, and the same percentage with which they have lost all but two of them. And all the quality media managed to ignore, or dismiss, the millions of Venezuelans who turned out in support of the Constituent Assembly election. We don’t yet have official figures for how many took part in the dry run. But initial estimates suggest it may have been even more than the 7 million that the opposition claims for its vote. 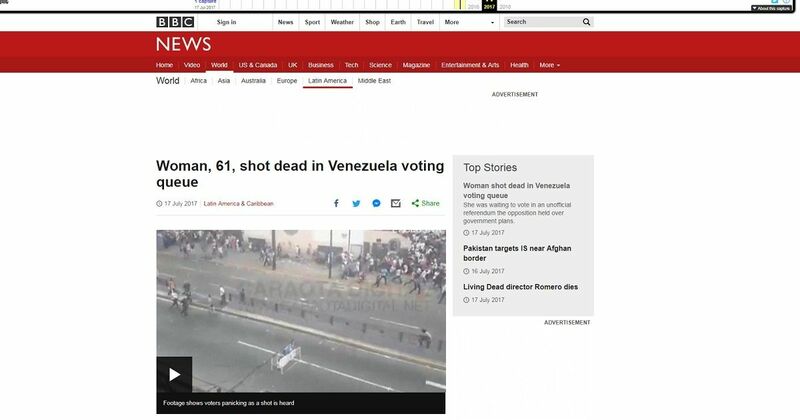 So, what should we make of the international media coverage of this important day in Venezuela? Plus ca change!